We’ve been asked a number of times in recent years, “when can we pre-purchase spectator tickets online to your major events”. The time is now. We’ve joined forces with TheFoat.com, one of the premiere and most trusted motorsports online ticket companies in the nation. Our alliance forges a ticket outlet that allows you to purchase tickets from the comfort of your home or office (or your phone) 24 hours a day, on a secure ticket portal that only takes a couple of minutes to complete and print. We will scan your printed ticket bar-code at the front gates when you arrive. It’s that easy. You can use your credit card to order tickets, camping and the like for events like the Ignitor, Fox Hunt, Nightfire and Halloween Classic. In addition, it is the official ticket source for all of the Street Outlaws-No Prep King events in 2019, including the Boise stop this coming July. 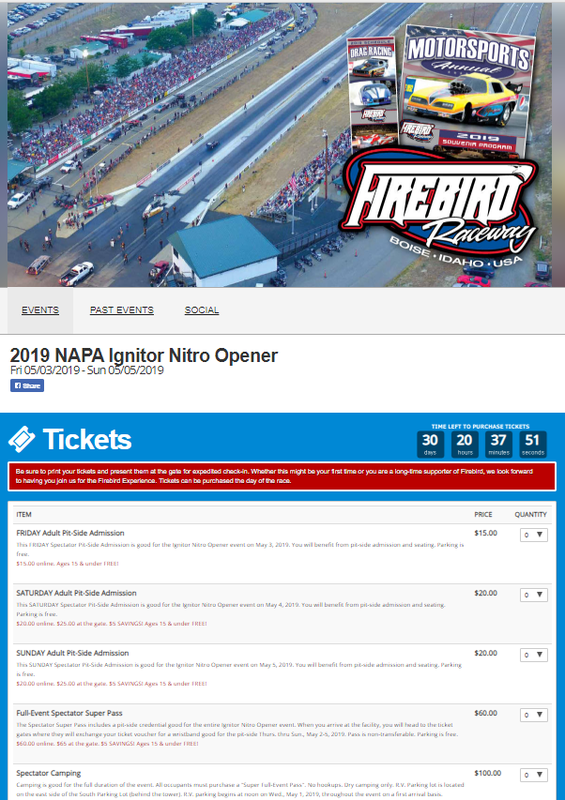 Check it out, it’s easy, descriptive and most important – secure and available for spectators to purchase tickets virtually around the clock to major events at Firebird.